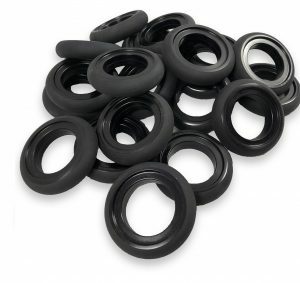 Hold Down Urethane Tires are one of the numerous specialty urethane products that are manufactured in the fully equipped cast polyurethane manufacturing facility and in-house machine shop at Plan Tech. Like every other product that is been produced at Plan Tech, our Hold Down Urethane Tires are made from only the very best of raw materials available on the market. Our team of technicians who are one of the finest the industry has to offer, always pay attention to details as well as apply speed and precision which allow us to meet the high volume demands of our numerous customers without a drop in quality. So, what are your specifications? Do they require great level of precision? Well, you can count on our engineering team to custom-make or mold Hold Down Urethane Tires that will meet the exact requirements of your application. Therefore, feel free to bring your sample, sketch or idea to us, and we will turn your imagination into a perfect finished product. The Hold Down Urethane Tires we manufacture are highly efficient when it comes to resisting wear, abrasion, chemicals, and corrosion. They are also capable of performing at their optimal best even after years of application. Better than metals and plastics, urethanes are capable of maintaining their high-performance ability such as their elasticity, etc., even under such temperature extremity that is below -60°F. Urethanes significantly weigh lighter than other elastomers, metals, and plastics inclusive causing them to perform better even without any solid backing. Are you interested in cast hold down urethane tires? Please Contact us so we can help solve your requirements and work with you on your specific application!